Tonight’s premiere of The X Factor on FOX reunites Simon Cowell with Paula Abdul and starts things off with 20,000 hopefuls in Los Angeles. Right out of the gate this looks and feels different—bigger—than American Idol to whom Cowell certainly has a lot to prove. As he has said, he walked away from the biggest show in America to see this venture through. We’re introduced to X Factor’s host; Steve Jones, and judges Simon Cowell, Paula Abdul, LA Reid, and Cheryl Cole (but, don’t get used to her pretty face, just yet). Auditions are not only in front of the four intimidating judges but also thousands of fans. Right now we’re into Phase 2 of the whole process. First the contestants had to make it past producers, so now we know who to blame. After they make it past this round -- facing the judging panel -- the contestants will be split into four categories: girls between 12 and 25, boys between 12 and 25, individuals over 25 (I’ve also read this is changed to 30, we’ll see), or groups (which may be formed from rejected soloists after the audition process). First up we have Rachel Crowe, 13, and we saw a snippet of her in the 8-minute preview. She reveals her family “has like no money” and they are six people with two bedrooms and she needs her own bathroom. Rachel chooses “Mercy” by Duffy and was as adorable and sassy as I remember from the tiny teaser we got before. Paula tells her what she did is exactly what she needs to do. Cheryl Cole loved her before she even sang a note, LA Reid says she has everything anyone he has ever signed has had: she has it all. Simon said she reinforces they were right to lower the age to 12 and he thinks we’ll be hearing a lot about her. Simon says “Get ready for a new bathroom, its four yeses” and winks at her. Next, we get an elderly couple Dan and Venita (83 and 70) from Pahrump, NV. Benita is a lot like Paula is now and tells us with their winnings they would tour in their travel home to all the best senior centers. They sing “Unchained Melody” and it’s a bit of an off-key wreck. They are very sweet and loving and it appears one of them messes up the lyrics at least once. I’m reminded of those Christmas albums with the dogs and cats “singing” to Jingle Bells. Simon said it was terrifying and he can imagine himself and Paula being them in ten years’ time. No brainer- they get four nos. Beyoncé wanna-be Simone Battle tells us for about three minutes how wonderful, fabulous, and talented she is all while popping her booty in short, red satin shorts. Simon dubs her as annoying almost instantly. She’s definitely a really pretty girl and as she’s singing the Pussycat Dolls’ “When I Grow Up”: it’s apparent she’s super confident but not a natural singer. Cheryl and Simon liked her a lot. LA Reid disagreed with both of their assessments that she has massive potential. Simon asked her to do something with no music and her voice was better than I thought. While LA didn’t buy into it, the other three said she’s worth taking a risk on. Stacy Francis is 42 and a single mom to two young ones, we saw a bit of her audition in the 8-minute preview and her sad story is having had an abusive, non-supportive manin her life for a long time. She says she puts her babies to bed and goes in the bathroom and sings Aretha and Whitney songs. Her audition song is “Natural Woman” and while it started a little weak in the lower notes, less than ten words in, she already had the audience cheering. Her voice is the first to give me goose bumps this entire night. She’s the one who made Simon mouth “wow” before she was even done. The judges gave her a standing ovation, as did much of the audience. LA said everything he does musically is to have his spirit stirred and hairs on his arms raised and she did both. Simon said “I loved it, loved it, loved it, I love you.” Simon said she got 4,304 yeses. I hope something big happens with her and I hope she doesn’t annoy me and make me turn on her. We head to Seattle where Nicole Scherzinger is introduced as Cheryl Cole’s replacement, and I expect to see a lot of JLo-esque adulation from the X Factor hopefuls. Marcus Canty is next and his Mom has given him one last chance after his two year window to pursue his dream before he needs to put it on a shelf and complete school. He sings “I Wish” and is a lot like Stevie Wonder and James Brown in one package. When he’s done he is overcome with probably a million emotions and clamps his hand over his mouth and sinks to the floor. LA Reid compares Marcus to Bobby Brown, Nicole says he’s who they’ve been waiting for, Paula said he’s adorable, relevant and fresh. Simon said it’s a song he normally instructs people to not sing but he liked it and likes Marcus and compares him to Usher. He predictably gets four yeses. 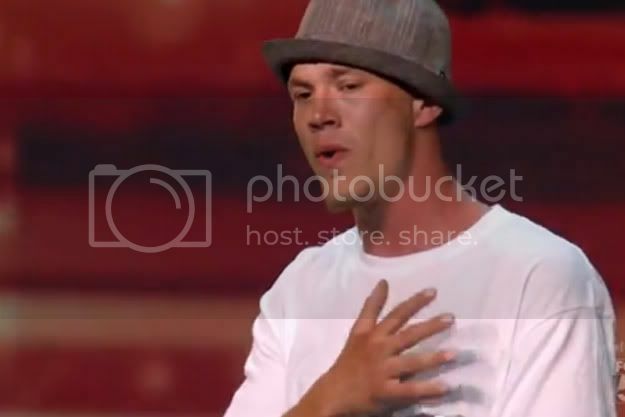 The final audition is Chris Rene, who is 28 and has a two-year old little boy, is fresh out of rehab and looking to pursue his dream. 70 days clean, Chris is singing an original song called “Young Homie,” He sounds like a Bruno Mars, Shifty Shellshock combo. The lyrics are simple and his voice isn’t super strong but there’s talent there and I’m pretty impressed. Plus, you know me; I’m a sucker for a sad story. Judges loved it, LA Reid looked super intense and serious about it all and gave Paula a high five. Simon said his favorite feeling in the world is sitting in that chair and meeting a star for the first time. He also said he has a feeling that maybe Chris needed the show but, also maybe the show needed him. Simon said they put him through and he better stay straight, that’s the deal. This kid made me cry like a fool; I love him. Scotty Mc-who? I am all in on this show and cannot wait to see Thursday’s auditions and get to the shows where the contestants are working with their coaches. Did you watch, what did you think?